Students from Testing Science (Food) programme visited Hong Kong Yakult Company Limited on 27 March 2018. The visit provided practical knowledge about food safety management system for the students. Students from Testing and Certification programmes joined the tour organised by the Hong Kong-HuiZhou Youth Exchange Promotion Association on 8-10 January 2016. Mr. Nabil A Molla, Director-General of the GCC (the Cooperation Council for the Arab States of the Gulf) Accreditation Centre, visited The Open University of Hong Kong and had a meeting with the Testing and Certification programme team on 01 December 2015. For those who missed the specific advice seminar for the Testing and Certification (T&C) programmes on OUHK Full-time Programmes InfoDay (15 May 2015), you can now review the recorded video of the seminar on Youtube with the link HERE. The OUHK staff including T&C academic staff was interviewed by the Channel DBC 4 radio programme 《通識．通通識》 on 15 July 2015. The radio programme has been uploaded on the DBC website. The part of radio programme about the interview on OUHK programmes can be found with the link HERE starting at time code 18’15. 3M Hong Kong Limited was invited to give a seminar and workshop on microbiological testing methods for Top-Up BSc (Hons) in Testing Science (Food) students for a course – Food Analysis, on 12 March 2015. A workshop to HK JEBN (樓上) was organized for Top-Up BSc (Hons) in Testing Science (Food) students for a course – Principles of Good Manufacturing Practice, on 6 March 2015. (From left) The Registrar, Testing and Certification (T&C) Programme Leader, and two T&C Students of the OUHK were interviewed by the Radio Television Hong Kong (RTHK) about the T&C programmes in the OUHK on 3 March 2015. Three representatives from the Korea National Open University visited the testing nd certification laboratories in the OUHK on 27 June 2014. 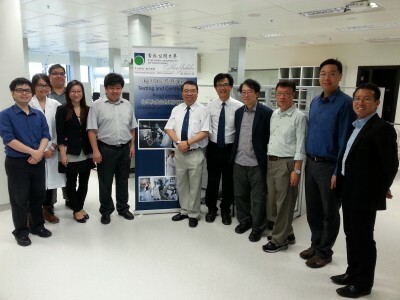 Prof. Lee visited the testing and certification laboratories in the OUHK on 12 June 2014. 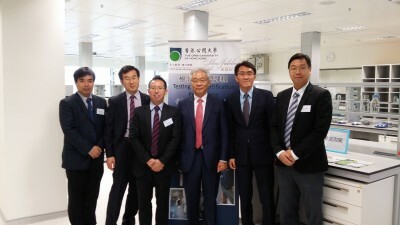 OUHK Testing & Certification Seminar was successfully held in Serena Yang Lecture Theatre, The Open University of Hong Kong on 3 Nov 2012. The Speakers’ powerpoint files in the OUHK T&C Day will be sent to the attendees’ emails soon after we obtained the Speakers’ approval.